All of a sudden my Stephanotis plant has sticky leaves??? 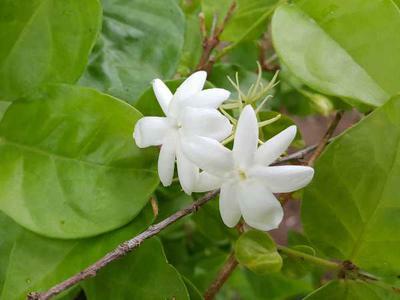 Madagascan Jasmine, more properly called Stephanotis, is a beautiful scented vine, which is usually grown in a conservatory or greenhouse. It's hard to copy the same conditions as it would get in a jungle in Madagascar anywhere else. This sets it up to be susceptible to some pests, which can be hard to identify and treat. Sticky leaves generally indicate some kind of sucking pest, and in this case I'm going to suggest getting a magnifying glass and looking very closely at the stems as well as the leaves. I suspect scale, which will show as bumps on the stems. Sometimes they go unnoticed because they don't move, and they look just like the bark. Scrape them, and it will be obvious. The problem with them (apart from sucking the life out of your plant) is that they have a crawler stage, which runs around and infects all your other susceptible plants. Isolate the Stephanotis, if possible. The best treatment is some kind of spray with oil, such as warm water with olive oil or other cooking oil in it, and a bit of dish detergent. This will smother the adults, but it's hard to get rid of the juveniles until they settle in place and start sucking. This beautiful plant can get other insects too, such as white fly, aphids and spider mites, but this treatment will work on all of them. Spray the plant completely, upper leaves and lower, and repeat several times. Then watch it like a hawk in case they return.